In the recent past, cloud computing myths varied from one extreme to the other. At one extreme we heard ‘cloud is less secure than on-premise systems’ whereas the other extreme sounded like ‘cloud should be used for everything because our boss said so’ (Interesting read: The Top 10 Cloud Myths). Amidst these fluctuating myths, few organizations defined cloud well and paved a way forward by deriving a viable cloud strategy. Developing a cloud strategy is not a trivial exercise consisting of detailed scoping and implementation planning in addition to systematic thinking and continuous improvement over multiple iterations. In short, there’s a vision for what cloud should be, a process and then a path, with various checks and balances to ensure the approach aligns with the goals of being cloud ready. A company may have many use-cases and hence may have several requirements to be fulfilled by a single consistent cloud strategy (e.g. independent business units such as HR, Finance etc., end-customer or internal employee-facing requirements may consider cloud strategy for a specific product line such as ERP systems). I came across a few readily available frameworks being adapted for deriving a company-specific cloud strategy while working with our largest customers. One of the most famous decision frameworks was proposed by Gartner and a summary is available at ‘Create a Cloud Decision Framework’. The most detailed framework that I referenced with our customers is known as the 6-5-N framework. It is 3 dimensional matrix which considers 6 actions on a horizontal dimension starting with WHY (motivation e.g. fast response into new markets), WHAT (S.M.A.R.T. enabled strategic targets), WHO (identify stakeholders), WHERE (cloud data center locations), WHEN (strategic milestones), HOW (strategic measures such as change management, technology measures such as network connectivity, application pilots etc.) and 5 perspectives for each of the 6 actions. These perspectives are governance (e.g. risk management, compliance, law and regulations), process (e.g. DevOps, containerization, version control, release and configuration management), technology (e.g. compute, networking, storage, database, IoT), application (e.g. public or private, development, testing, migration) and business (e.g. finance, sales, HR, partners etc.). Finally, the N represents the multiple iterations over the cloud strategy lifecycle. 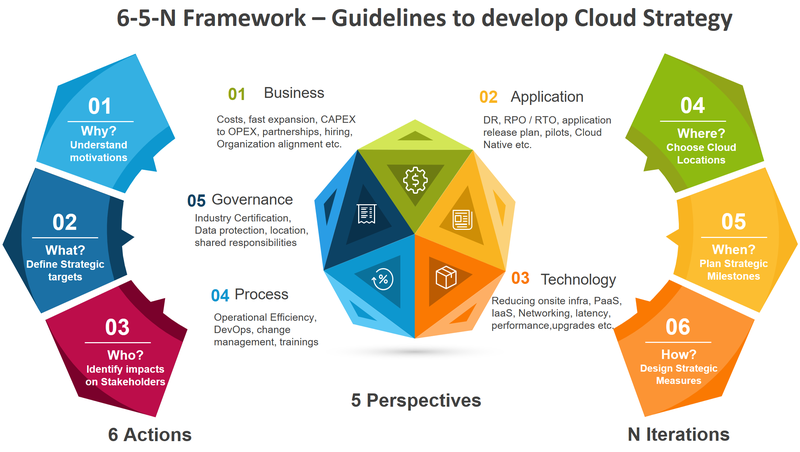 For more details, a detailed documentation is available at ‘A Framework For Developing Cloud Strategies’. A carefully crafted cloud strategy would be a balance of the different perspectives such as costs, governance, processes, technology, security, and access. This strategy should also be able to adapt to the everchanging demands of the business and mitigate potential risks. As cloud computing is becoming de facto standard fueling IT infra-application modernization and buyers are realizing many more ways to save costs beyond pay-as-you-go (e.g. economies of scale, optimized operations, ease of managed and on-demand services, increased business focus), a clear trend of adopting 2 or more cloud providers is slowly emerging. This is where the term Multi-Cloud comes into the forefront. A detailed Forrester research on this trend can be found here: Brief: A Clear Multi-cloud Strategy Delivers Business Value . This strategy has its benefits such as flexibility, different options for different use cases, reliability etc. to name a few but this trend is partially fueled by the desire to stay neutral and avoid any major cloud vendor lock-in. The term Multi-cloud is often confused with hybrid cloud and hence used interchangeably in the literature. The basic difference between the two is that hybrid cloud always combines the private (could be on-premise) and public cloud for the same business purpose (e.g. think hypothetical eCommerce website from a microservices architecture perspective: product catalog, item pricing structures, invoices coming from Private cloud, sentiment analysis from Google Natural language service, high definition images coming from AWS for multiple regions and so on) whereas in case of the Multi-cloud, a company can rely on multiple public cloud infrastructures (but under a private network) for different kind of applications based on its unique needs and usually these applications don’t intermingle with each other. Additionally, what type of cloud you see (Multi-cloud or Hybrid Cloud) may depend upon if you are a CIO or business application developer. 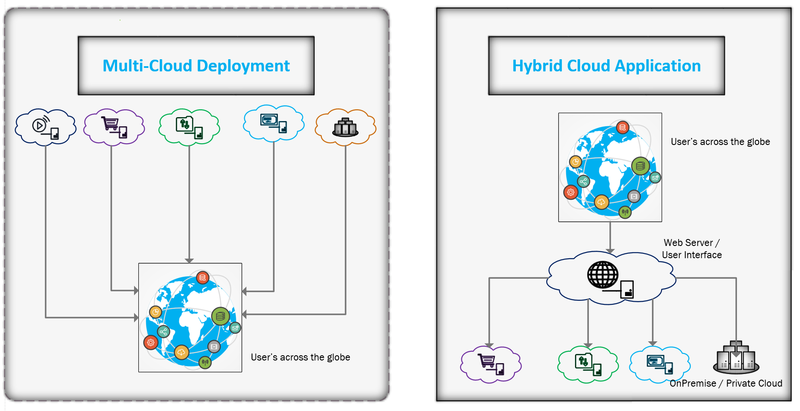 An excellent analysis of this topic can be found here: Cloud Strategy: hybrid cloud and multi-cloud are not the same. According to the MIT Tech review: VOICES OF (MULTI-CLOUD) EXPERIENCE, most of the companies implementing a multi-cloud strategy find it extremely difficult to steer through multi-cloud operations in the initial years. Most of the organizations struggle with the new technology challenges and learning curves associated with them. Apart from technology heightened data governance issues, people and processes (think new demand planning, putting innovation capabilities to good use etc. ), policy adjustments (thinking cloud first, confidence and control with security), migration-related challenges, calculating real ROI etc. are also listed as the factors that complicate the matter. This research study also highlights that cloud adoption requires comprehensive changes across an organization and an extended run with the cloud environment positively influences the confidence in cloud-based operations. For nuanced cloud management problems like predictive elasticity control, administrative control and VM scheduling issues that arise by adopting such a cloud strategy, I recommend the following research paper: Challenges for Multi-cloud Architectures. As a cloud service provider SAP (SAP Hana Enterprise – SAP’s private managed cloud and SAP Cloud platform – SAP’s public platform as a service) is working directly with the multiple public cloud infrastructure providers (read: Azure, AWS, GCP etc.) commonly known as Hyperscale cloud environments. By enabling multiple SAP products/services on multi-cloud (or hyper-scaler) environments, the overall complexity of multi-cloud deployment can be managed. The overall aim is to support our Enterprise customers in executing a multi-cloud deployment strategy and providing a guided path to various cloud environments. This will help SAP HANA Enterprise cloud customers to avoid any major cloud vendor lock-in, simplify contracting terms and offer generic TCO related benefits of operating cloud at scale, cloud infrastructure migration and understand our standardized offering for multi-cloud deployments. Part 2 of this series will discuss some of the technical aspects to ensure smooth operations for SAP Workloads across the multi-cloud deployments.